Like a candle that sits in a window at night. On March 11th, 1948, Sr. Mary Margaret took the vows of the religious order of St. Joseph of Cluny: chastity, poverty and obedience. Known then as Sr. Victoire, she consecrated her life to God. The values of honesty, sincerity and humility were embedded in her religious life; and with her genuine caring, love and trust, patience and unfathomable understanding, this great lady of strength was able to light the path, to shape the minds, hearts and spirits of so many of her staff and students. 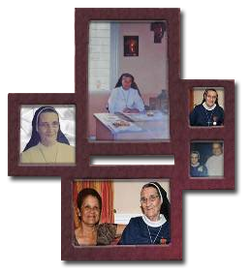 A few months after her retirement as Principal of Maria Regina Grade School in 2007, Sr. Mary Margaret took up residency at the Sisters of St. Joseph of Cluny's convalescent home, Lourdes House, in Arouca. She embraced many responsibilities there among which included preparing the chapel for daily Mass and the liturgical seasons, assisting in the kitchen, administering spiritual support to those who were ill, welcoming all who came to visit and assisting the Superior in the management of the home, in whatever way she could. Sr. Mary Margaret, although limited in her mobility, was able to pay Maria Regina Grade School a final visit before her death where she marveled at the improvements that had been made with the rebuilding and renovating after the fire in 2009. Sr. Mary Margaret passed away on 14th March 2012.